Health and beauty are the recipe for success in today’s world. If you own a beauty facility - whether it’s a beauty salon, a barber shop or a makeup school, you are interested in attracting more new clients on a daily basis. This is not a problem anymore thanks to the possibilities provided by internet. An eye-catching website will ensure a steady client turnover and better income. Just look at your competitors - all of them already have well-designed websites, so why don’t you? Even if you’re a total noob in the field of web design, there are so many options for site creation. WordPress CMS is the best platform that can be a solid basis for a great online resource. All you need is to choose one of makeup artist WordPress themes included into this collection. Seek no more - we have put together a selection of 10 best Beauty WordPress themes that are worth seeing right now! Each of the themes is supplied with a vast selection of functionality and design options meant for a beauty industry-centered web project. All these themes are 100% responsive, simple to modify, have lots of incorporated tools for messaging and administration, and are backed up with free 24/7 tech support! 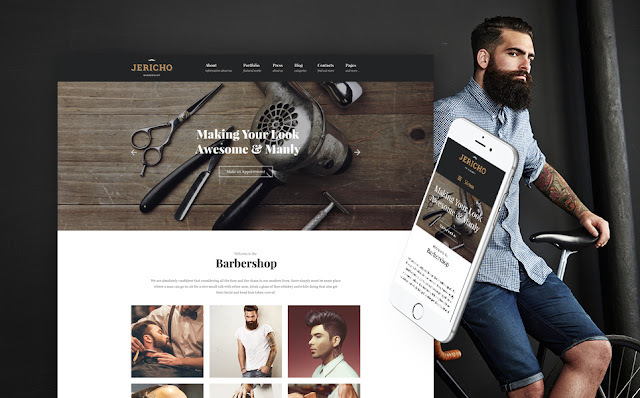 Jericho is a versatile barber shop WordPress theme that will fit any fashion portfolios, hair salons, fashion blogs etc. The theme gives a vibe of lumberjack romance, its design is inspired by a classic barber shop and hipster culture. Be sure, you’ll put up an eye-catching and professional looking website in next to nothing. Jericho WordPress theme was built using the latest web technology like Cherry Framework 5 and comes packed with Live Customizer. This ensures easy customization process in real time. Thanks to Cherry Projects plugin and a Power Page Builder you are provided with a great opportunity to change your theme the way you want. All you need is to select from 6 blog layouts, 3 sidebar positions and multiple color schemes! To test-drive Jericho, just hit the ‘live demo’ button! 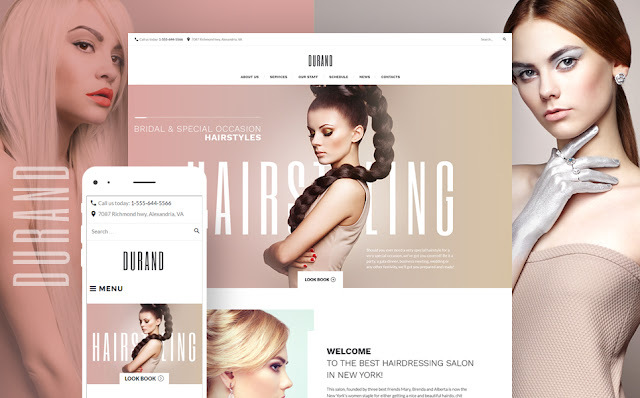 Durand is a stylish hair salon WordPress theme in pastel colors developed for hair stylists, beauty salons and makeup artists. Just imagine, you can put your web pages together fast and easy without using a line of programming code! All thanks to the flexible Power Page builder. Feel free to make use of 25+ modules, a full-blown preset library and drag-and-drop functionality to build a unique design. Durand provides you with advanced options for website configuration, so you are free to customize the look and feel of this theme having absolute control over the process. Besides, multiple content modules will let you insert different types of content on your web page (for instance, image sliders, buttons, images, contact forms and so on). Madeleine is a pleasant looking spa WordPress theme that can be used for different types of projects. This is achieved thanks to a variety of fonts and color schemes, content boxes and service banners. Design-wise, all elements in this WordPress theme look gentle and feminine. While scrolling down, web viewers get to see 4 call-to-action ghost buttons. This theme is extremely user-friendly, so at the homepage bottom your prospects will see the contacts, while at the top - find a search box and a call-to-action button. Get a test-drive of this great theme by clicking the ‘live demo’ button now! Fiona is a massage salon WordPress theme that looks professional and gentle. Licensed under GPL v3.0., it can be installed on multiple domains unlimited number of times. Feel free to tweak the theme’s code any way you see fit for your project. Created in compliance with the most recent web trends, the theme has a valid and clean programming code. 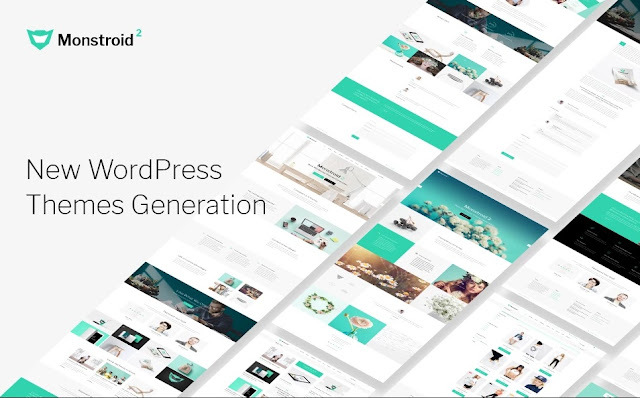 Live Customizer comes packed with this WordPress theme and provides you with easy managing of its look and feel, and observing the outcome in real time without reloading the page. This item is extremely visually appealing, which makes it suitable for health and beauty online projects. Thanks to HQ images and beautiful typography contribute to readability of website content. 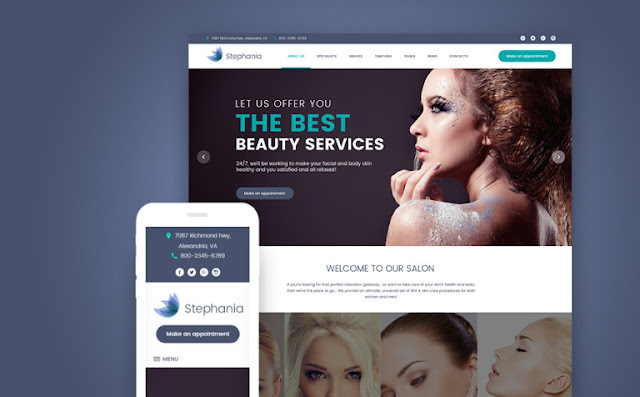 Stephania is a state of the art beauty salon WordPress theme that can boost the flow of clients to your skincare and spa salon. Its modern and functional design will draw in prospects to your website, while user-friendly navigation will persuade them to stay longer. This theme has an outstanding visual appeal - all thanks to the image slider and other design elements. The ‘TM Gallery’ module is a handy instrument for building an eye-catching portfolio. Also, there are ‘Cherry Services’ and ‘Cherry Team Members’ plugins that will let you praise their professional skills. Power Page Builder modules can be used to make your website performance more efficient. Make use of video slider, audio, sidebars, related posts and other elements. The Live Search bar contributes to the user-friendliness of this theme and helps to deliver the relevant content to users. Besides, the ‘Appointment Manager’ plugin will allow your clients to book a spot for a spa treatment. Select this top-notch beauty salon WordPress theme to launch your health and beaut resource on the fly. 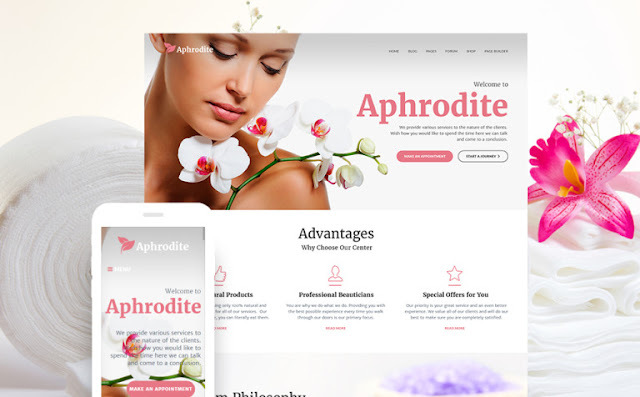 Aphrodite is a WordPress theme created specifically for beauty and spa salons to promote beauty websites. With this great theme, persuading new customers to visit your salon will be a picnic! Also, people will be able to access your website using their mobile phones or tablets thanks to 100% responsive design. Stylish backgrounds and pleasant flower tones make this theme more attractive for your prospects. Supplied with Cherry Framework 5, it lets you highlight the beauty services you provide demonstrating great results using Cherry Projects portfolio. Besides, ‘Cherry Team members’ and ‘Cherry Testimonials’ plugins will help you throw in more reliable feedback from your clients. The ‘Appointment Manager’ plugin will help your clients book appointments and find the time slots in your salon schedule. Also, you’ll be able to present the best offers with Website Slider, providing the prices within the Pricing Table. Use this gorgeous beauty WordPress theme to help your clients to come up with a perfect plan for their relaxation. RedInk is an eye-catching tattoo salon WordPress theme, just perfect for a tattoo studio or salon. The theme provides plenty of great tools to showcase the uniqueness of your work in the best possible way, for example ‘TM Gallery’ module. Besides, it’s possible to make your online project look unique using multiple blog layouts combined with versatile header and footer styles. Feel free to create professional looking webpages with Power Page Builder. Also, you can switch the look of the buttons and alter your site in real time mode with WordPress Live Customizer. Owing to the support of multiple languages and currencies, your online project will become more user-friendly. Google map plugin will let the web users find your location without any extra effort. Based on Cherry Framework 5, the RedInk theme features inked backgrounds, great typography, LazyLoad effect and Parallax scrolling. Samson is a versatile WordPress template that can be used for a hair salon or hair clinic. Its clean and high-performance layout will absolutely fit the purpose of your project. Supplied with an ideal combination of text content and HQ stock images, it has a ‘Testimonials’ section which will only add to your website’s credibility. Besides, you can provide as much contact information as possible for better client conversion. Thanks to the ‘Appointment Manager’ plugin, your clients will be able to book appointments and see the vacant time slots on the schedule. Click the ‘live demo’ button to have a test-drive of this hair salon WordPress theme! Try the image hover effect and other tiny elements and details making the overall design more user-friendly and appealing. 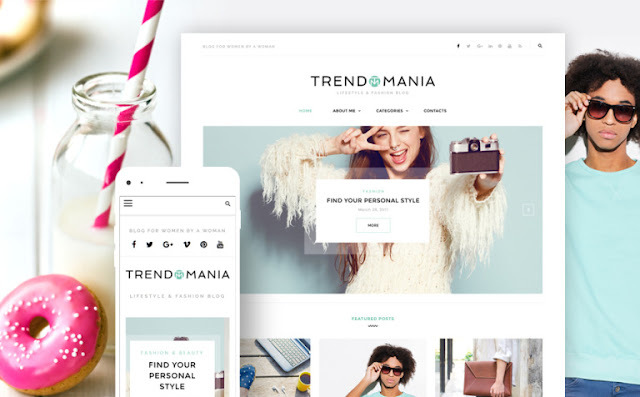 Trendomania is one of the most versatile design blog WordPress themes tailored for building fashion, lifestyle or personal blogs. Thanks to its stylish and trendy design, this WordPress theme will be a great fit for makeup artists, beauty salons and barber shops as well. It’s quite rich in features and is supplied with versatile header, footer and sidebar variations. This is why you can create a unique design for your fashion blog. Live Customizer will enable you to modify this template the way you want, it’s possible to alter the color palette, change the fonts and blog layouts in several clicks. All alterations can be seen in real time - no need to reload the page. 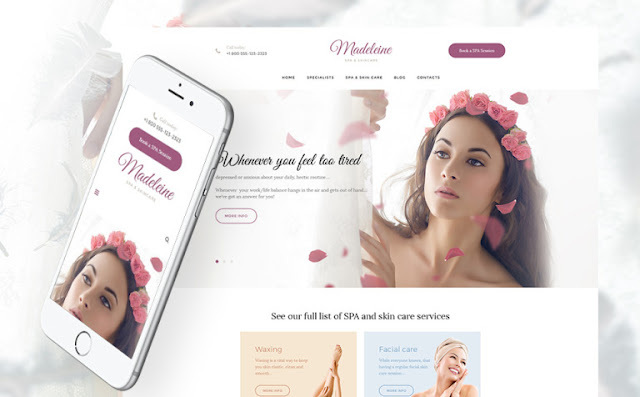 Obtain this design WordPress theme to create a user-friendly online resource to promote your beauty services! Monstroid2 is a versatile multipurpose WordPress theme that is capable of doing it all! This juggernaut theme features 7 header styles, 4 custom blog styles, and an intuitive page builder. Thanks to this you can create complex web pages combining different styles and layouts. Moreover, the theme comes packed with different plugins, including WooCommerce plugin for eCommerce projects.You will appreciate how easy it will be to establish an online shop in several clicks. Also, Monstroid2 theme has Parallax scrolling and background video featured. This will give your website a more dynamic appearance. The theme has an inbuilt form for appointments booking, so your guests will easily make reservations and see vacant time slots in your schedule. Customizing Monstroid2 won’t be a big deal - it is supplied with rich documentation. In case you face any difficulties, there is a free 24/7 technical support to address. Well, you have just reviewed the round-up of our best WordPress themes for beauty websites. If you’re a makeup artist, cosmetologist or tattooist, you absolutely need a solid web representation to reach your target audience.In this collection there are themes that meet the requirements of a top-notch beauty online resource. You can make sure this is true just by clicking a ‘live demo’ button and having a test-drive of the themes you dig! Select the best WordPress makeup artist themes for your beauty website! So, which theme did you like best? Which one would you use for a project of your own? What other themes would you have included? Feel free to share opinions and sound off in the comment section below!